Home > Using Water > Where Does Your Water Come From? Where does your water come from? The obvious answer is the sky, or maybe even, your tap. Yes, of course, quite right – but the really interesting part of the question is what happens in between. 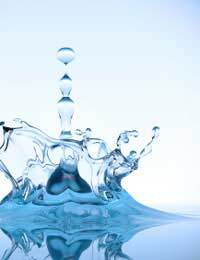 Surprisingly, although just over seven tenths of the surface of our planet is covered with water, only a tiny amount of it – a mere one per cent – is liquid fresh water, although that never-the-less is still an awful lot! It forms part of an endless cycle, where evaporation from the oceans lets rain, hail and snow fall around the world, and although most of that – collectively known as ‘precipitation’ – falls back into the seas themselves, rivers, lakes and underground reservoirs depend on the relatively small amount which falls on land. Ultimately, of course, so do we. Fortunately, in the UK, much as we may gripe about all the rain, for the most part it means that unlike an increasingly large number of places around the globe, our own green and pleasant land largely remains, well, green and pleasant. It also means that if you take a look at a map or a satellite image of our country, one of the first things you’ll see is the number of rivers and lakes dotted across the picture, and some of them are pretty large. Admittedly they’re not large in the way that you’d say the Great Lakes of North America, or South America’s mighty Amazon are, but big all the same, especially in an island quite so small. In any case, their significance isn’t in their size; it lies in what they contribute. Around two-thirds of the water supplied to the homes of Britain’s 60 million or so inhabitants, and all the country’s shops and factories, comes from rivers and reservoirs – officially termed ‘surface sources’. Glasgow, Liverpool, Birmingham and countless other cities around the UK draw their raw water from sources such as these – though it does get treated quite a bit before it eventually ends up at their taps. Not all of the rainfall ends up in rivers and surface bodies of water; a sizeable amount soaks down into the ground – hence the name ‘groundwater’ – and pools in systems of natural underground reservoirs, known as aquifers. They form where the underlying rock is either naturally porous, such as sands, gravels and sandstone, or has become cracked sometime in the past. Aquifers in different parts of the country hold varying amounts of water, depending on the exact nature of the rocks, local climate and the amount of rainfall. Where the water from aquifers finds its way above ground and flows naturally out of the surface, typically when the porous layer meets a harder seam of impermeable rock, a spring is formed. Wells and boreholes are essentially the same idea – artificially constructed channels, dug down to reach the water below. Groundwater makes up the remaining one-third of Britain’s overall water resources, although in some parts of the country, such as London and the south east for example, it accounts for almost three-quarters of the region’s regular domestic supply. This also explains why the water is naturally hard or soft in different areas – as a general rule aquifer water tends to be harder than surface water as it has spent more time in contact with rocks and thus had longer to collect more of the dissolved minerals responsible for hardness. Wherever the actual water supplied to your home comes from, of course there’s a whole series of steps, including screening, clarification, filtration and disinfection, to go through before it finally arrives – but that, as they say, is another story!